Curtis Stigers : "Never Saw a Miracle"
While I understand very little about what these people are saying to me, one thing is quite obvious...they are grateful. We saw 209 indigents on our first day. One man didn't want to take his shoes off for me so that I could check his height and weight--he was embarrassed by the smell of his feet. Many men work in the fields in the hot Honduran sun, and spend several hours walking to us. It's no wonder some have elevated blood pressures! We see a mother and her young boy with a cleft lip...a family with scabies...one family needs treatment for worms...one man who tells my translator that he's here to see the doctor because of "mushrooms" on his feet. There is also a brave boy who walked almost 3 hours, one way, to have medical attention to his swollen nose. 7cc of pus was drained, and he journeyed home...only to return again the next day for more treatment. It was common to see an 8 year-old walking herself to us..alone. Or a 12 year-old only with her young sister. There was also a mother and her 3 children--one which was a baby that she had to carry for the entire 1 hour walk. We went on a home visit to help a man with difficulty walking get a cortisone injection into his knee. What was striking was to see how these people live... there is no ventilation going through his house, as evidenced by the sweat dripping from my brow. Yet, he was laying on his bed, dressed in long pants, shirt and a wool hat! He shares this small home with his extended family...there are chickens roaming freely about his living quarters. 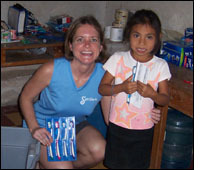 The most memorable experience was a visit to a Honduran family's home for dinner. Our team of 3 brought tortillas, eggs, and refried beans to feed our family...7 children (included are a set of infant twins!) and a mother and a father. It is clear when we arrive that we haven't brought nearly enough food to feed us all. We allow the family to eat first, our team of 3 sharing half of a tortilla. It quickly turned dark and we found ourselves conversing with the family by flashlight. The father speaks proudly and says he is lucky if he is able to work 1 day a week in the cornfields. One of the younger children amuses herself with my flashlight. Another child is swinging back and forth on a hammock. We are told that mother and her twins sleep on a mattress of sorts...the rest of the family on the cement floor. We leave our home humbled and hungry, yet content to dine on a Power Bar and soda for dinner back at our school. We've all long used the expression, "to give the shirt off of one's back". I did just that. On our final day, the family from our home visit came to see us for care. I wanted to do something...anything to help this family who had very little tangible items. I packaged the clothing I was wearing, the shirt and shorts I had been sleeping in, my blanket and pillowcase, and gave them to the mother. After hearing our story of our visit, others on the team wanted to help as well...we sent them on their way with several shirts for the father, and a bag full of Power Bars...a small donation, but something. The last patient that I saw was an elderly woman named Isabel. It is hard to determine age on many Hondurans, as some are completely unaware of their birthday. As soon as she saw me, she embraced me and said she didn't know we were coming, but was so happy God brought us to her. An appropriate ending to my journey.